The Sasquatch! Music Festival is set in a scenic Pacific Northwest gorge, where the party gets funky with rock bands and singer-songwriters galore. This one takes place in George, Washington. Sasquatch! Has Passed See Festival Photos, Videos and More Below. Sasquatch! Music Festival is an annual music festival held at the Gorge Amphitheatre in George, Washington. In recent years, it has taken place on the Memorial Day weekend, running for three to four days. In 2014, Adam Zacks decided to expand the festival to two weekends due to the high demand for tickets in 2013. Rather than expanding to two four-day weekends, the festival instead only expanded to two-three day weekends. The Sasquatch! 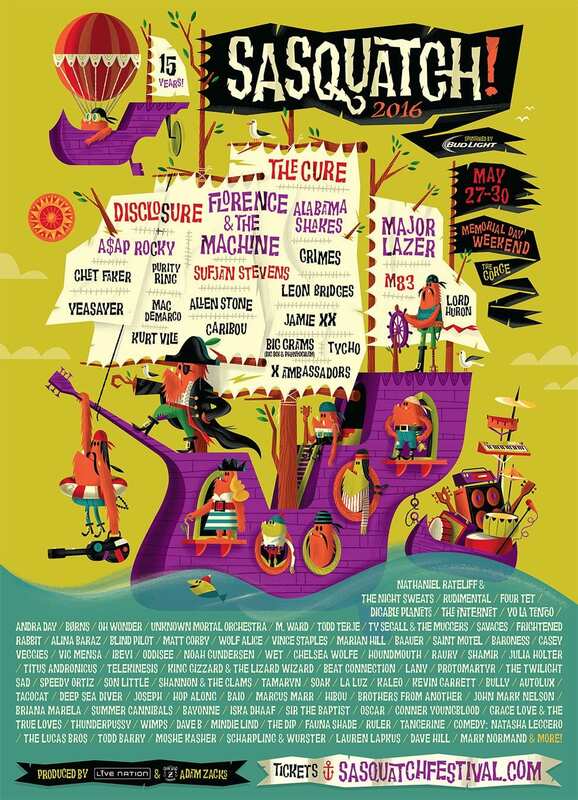 Music Festival was founded in 2002 by Pacific Northwest-based concert promoter Adam Zacks. Sasquatch! typically features a range of musical genres, with the emphasis being on indie rock bands and singer-songwriters, but also including alternative rock, hip hop, EDM, and comedy acts. The festival features multiple stages, including Bigfoot, Banana Shack and Yeti, among others. Most attendees of the festival camp in designated campsite fields nearby, as the venue is relatively remote and there are no large urban areas nearby. And the Gorge is a site to behold.